The family of Atcherley of Marton has been settled in that neighbourhood at least as far back as the reign of Henry VII. Their ancestor, Sir Roger Atcherley, Knt., who was born at Stanwardine, in the parish if Baschurch, within about a mile from Marton, was elected sheriff of Middlesex and London, 21 Sept. 1504, 20 Henry VII., and was chosen lord-mayor of London, 18 October, 1511, 3 Henry VIII. He is mentioned in Fuller’s Worthies […], and also in Stow’s Survey of London […], as having munificently stored Leadenhall for the relief of the poor. He filled several civic offices of high trust with distinction, and died in the month of July, 1521, 13 Henry VIII. – A genealogical and heraldic dictionary of the landed gentry of Great Britain and Ireland, 1847. I could take issue with a couple of the ‘facts’ about Roger Atcherley in the paragraph above – in fact, in due course, I will! But John and John Bernard Burke’s brief pen picture of Roger provides a good starting point for a more detailed look at a life which ended nearly five centuries ago. That a more detailed look is even possible is quite something, given the period in which Roger lived. For that we have to thank, in part, the fact that he did indeed fill several civic offices of high trust with distinction. Roger Achley Maior of London, in the yeare 1512. the third of Henrie the eight, when the said Maior entered the Maioralitie, there was not found one hundred quarters of wheate in all the Garners of the Citie, either within the liberties, or neare adjoyning: through the which scarcitie, when the Carts of Stratford came laden with bread to the Citie (as they had beene accustomed) there was such presse about them, that one man was readie to destroy an other, in striving to bee served for their money: but this scarcitie lasted not long: for the Maior in short time made such provision of Wheate, that the Bakers both of London, and of Stratford were wearie of taking it up, and were forced to take much more then they would, and for the rest the Maior laid out the money, and stored it up in Leaden hall, and other garners of the Citie. This Maior also kept the Market so well, that hee would be at the Leaden hall by foure a clocke in the Sommers mornings, and from thence he went to other markets, to the great comfort of the Citizens. 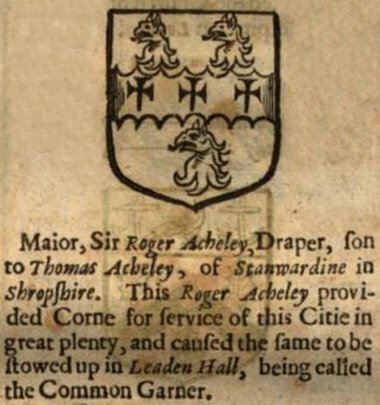 Stow also wrote Roger’s surname as Achiley, in his list of Mayors and Sheriffs, stating: “Mayor Roger Achiley Draper. This Roger Achiley provided corn for service of this Cittie in great plentie: Hee caused the same to be stowed uppe in the common Garner called Leaden Hall.” Others added an extra ‘l’ to Achiley, giving us Achilley – as in A Breviat Chronicle containing al the Kynges from Brute to this daye (published 1554), an extract from which is shown below. Sir Roger Achley, born at Stanwardine was Mayor of London 1511. Observing that poor People, who never have more than they need will sometimes need more than they have, [prepared] Leaden-Hall, (the Common Garner) and stored up much Corn therein, collecting from the present Plenty, a relief against an ensuing Famine. In the yeare also, 1511. the third of Henry the eight, Roger Achely Mayor, caused Dikes and Bridges to bee made, and the ground to bee leviled, and made more commodious for passage since which time the same hath beene heighthened. So much that the Ditches and Bridges are covered and seemeth to me that if it be made levell with the Battlements of the Cittie Wall, yet will it be little the dryer, such is the Moorish nature of that ground. A later author, possibly using Stow’s work as his source, wrote that the improvements at Moorfields, to which Moorgate provided access, were made “through the praise-worthy attention of Roger Acheley, Lord Mayor in 1511, who caused that waste to be better drained and levelled, and had bridges made to improve the outlets to the adjacent villages.” Moorfields was one of the last areas of open ground in the city, presumably because of the great wetness of the ground referred to by the above writers. Roger’s efforts seem to have been among the earliest to make the Moorfields area easier to cross. 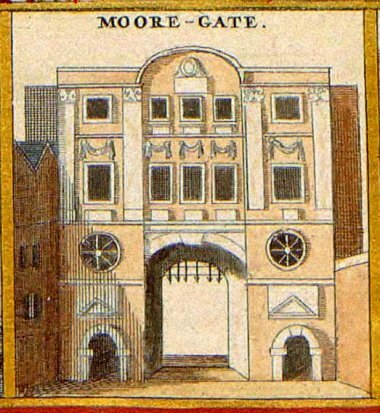 Moorgate has long since been demolished (the picture here dates from around 1650), and Moorfields drained and built over. Today the area is a financial centre. Newgate, London.—Commission to Roger Acheley, mayor, Sir John Fyneux, Sir Rob. Rede, Sir Will. Hody, Rob Brudenell, Humph. Conyngesby, John Boteler, Will. Grevyle, Will. Fayrfax, and Ric. Broke, serjeant-at-law. The City of London’s Sheriffs were elected each year by Liverymen of the City Livery Companies. This remains the case today, although of course the roles of the Sheriffs are now rather different! At least one of the two is an Alderman, a freeman of the city elected by the City’s wards. Aldermen, elected for life, were described in 1826 as “the principal magistrates in their respective wards” and “perpetual justices of the peace for the City.” Roger Acheley, was elected Alderman for Vintry Ward in 1504, not long before he was also elected Sheriff by his fellow liverymen. He removed from Vintry to Coleman Street Ward in 1510, and from there to Cornhill Ward in 1513. He continued as Alderman for Cornhill until his death in 1521. As we have just seen, to be elected as an Alderman, Roger Acheley was required to have been admitted to the Freedom (or citizenship) of the City. This could only be attained through membership of one of the Livery Companies. It has already been noted that Roger was a draper – so it should come as no surprise to learn that he was a member of the Drapers’ Company. Roger was ‘admitted to the Freedom’ by servitude – which means that he completed an apprenticeship with an existing member of the Drapers’ Company. This was back in 1479. Not long after, he settled in Cornhill. Within a few years, he had taken on an apprentice of his own – the first of several. He would go on to serve as Warden and (on two occasions) Master of the Drapers’ Company. This aspect of Roger’s life, however, deserves a story of its own. Picture credits. Title page of Stow’s A Survey of London (1603): From a 1908 reprint of the work; copyright expired. Extract from A Breviat Chronicle containing all the Kynges from Brute to this daye, published 1554, taken from Google Books. Moore-gate: Adapted from a public domain image taken from Wikimedia Commons. Extract from a 1633 reprint of Stow’s A Survey of London, taken from Google Books. John Burke, John Bernard Burke (1847), A genealogical and heraldic dictionary of the landed gentry of Great Britain and Ireland; Volume I, page 32. Copy viewed at Google Books. 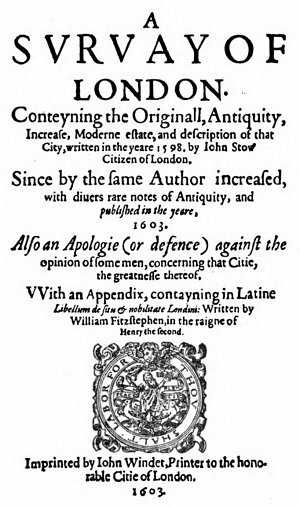 John Stow (1603), A Survey of London, pages 158, 530 and 33. Copy viewed at Google Books. John Michell (ed.) (1554), A Breviat Chronicle containing all the Kynges from Brute to this daye. Copy viewed at Google Books (no page numbers – navigate from the Front Cover to Section 16, then go back one page). George Sandys (1684), Anglorum Speculum, or The Worthies of England, in Church and State. Page 593. Copy viewed at the Hathi Trust website. P Austin Nuttall (1840), History of the Worthies of England by Thomas Fuller, D.D. A New Edition. Volume III, page 66. Copy viewed at the Hathi Trust website. Edward Wedlake Brayley (1814),The Beauties of England and Wales. Volume X, Part II (London and Middlesex), page 35. Copy viewed at Google Books. Moorgate. At: Wikipedia (website, accessed 22 Jul 2017). J S Brewer (1862), Letters and Papers, Foreign and Domestic, of the reign of Henry VIII. Volume III, page 287. Copy viewed at Google Books. Arthur Henry Johnson (1915),The history of The Worshipful Company of the Drapers of London. Volume II, page 55. Copy viewed at MyHeritage Compilation of Published Sources (page 71 of this digitised version). The Lord Mayor. At: The City of London website (accessed 23 Jul 2017). Lord Mayor of London. At: Wikipedia (website, accessed 23 Jul 2017). Mayor of London. At: Wikipedia (website, accessed 23 Jul 2017). Roman Dyboski (ed.) (1907),Songs, carols, and other miscellaneous poems, from the Balliol MS. 354, Richard Hill’s Commonplace-book. Pages 157 and 152. Copies viewed at the Hathi Trust website. John Stow (1566), A Summarie of English Chronicles. Folio 186. Copy viewed at Google Books. Sheriffs of the City of London. At: Wikipedia (website, accessed 23 Jul 2017). Henry Thomas Riley (ed.) (1862), Rerum Britannicarum Medii Aevi Scriptores, or Chronicles and Memorials of Great Britain and Ireland during the Middle Ages. Munimenta Gildhallae Londoniensis; Liber Albus, Liber Custumarum, et Liber Horn. Volume III, pages 185-6. Copy viewed at Google Books. John Britton (ed.) (1826), The Original Picture of London, Enlarged and Improved. Page 71 et seq. Copy viewed at Google Books. Anon (1657), The Practise of the Sheriffs’ Court, London. Copy viewed at Google Books. Alfred Beaven Beaven (1908), The Aldermen of the City of London Temp. Henry III. –1908. Volume I, pages 207, 109 and 123. Copy viewed at the Hathi Trust website. About Records of London’s Livery Companies Online (ROLLCO). At: Records of London’s Livery Companies Online (website, accessed 23 Jul 2017). Event Details [for Roger Achilley]. At: Records of London’s Livery Companies Online (website, accessed 23 Jul 2017).